Do you love snickerdoodles? Or caramel? I have combined both those delicious flavors to create this Snickerdoodle Caramel Ice Cream. This snickerdoodle ice cream is bursting with flavor from the cinnamon and maple syrup + it has a scrumptious caramel throughout. Have you ever checked the ingredient list on store bought ice cream? Seems to me there are a lot of unnecessary ingredients in it. Store bought ice cream is also usually really expensive. This homemade ice cream recipe is super easy to make yourself. I used full fat canned coconut milk to make this ice cream recipe. It’s very important to use the full fat coconut milk to get that rich flavor that traditional ice cream has. You can use almond or cashew milk, but keep in mind that the end product will be slightly icy in texture. If you are okay with that, feel free to use any milk you like. 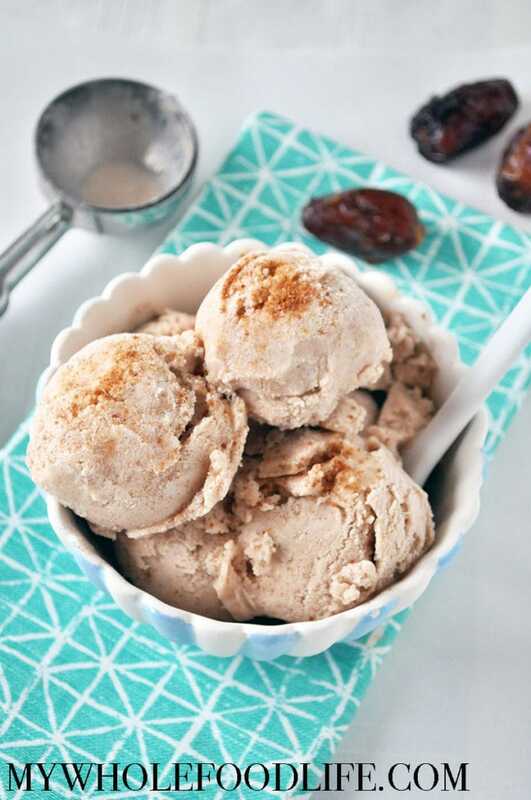 Cinnamon and caramel come together to make this amazing ice cream! Drain the dates that have been soaking in water. Place the dates into a magic bullet or blender . Blend until smooth. Set aside. In a blender , combine all the ingredients, except the date caramel. Mix for 30 seconds and then transfer to an ice cream machine. Turn the ice cream machine on. After about 12-15 minutes, slowly add the caramel. Use a spatula to move the mixture around, so it swirls nicely. Once the ice cream is done, turn the machine off and transfer to an ice cream tub . This ice cream will be a soft serve consistency. If you like a harder ice cream, place the tub in the freezer for an hour before serving. Enjoy! Thanks Melissa, I didn't notice the "set aside" in the first instruction. Reading is a skill :) Thanks again! I saw the title and thought that this would be super complicated. I cant believe how easy it is! I can't wait for the next hot day now!